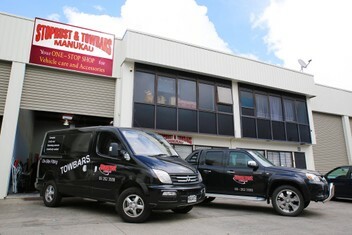 Stoprust & Towbars have been installing car accessories for over 30 years throughout Auckland via there Mobile fit service and factory in Manukau. Fitting of a towbar at our factory or we can come to you where ever you are. Special wiring harness may be needed for some late model vehicles. We also supply and fit reverse cameras and reverse sensors. Running Boards. Hard lids for Utes including motorised lids. front and rear bull bars and bumper replacements. also roof racks. We also do complete van fit out with wooden floor and van shelving with trays and cargo barriers. Great guys & good price. Had my flimsy factory tow bar swapped out for a heavy duty one from these guys. Super easy to book in. Swap took 1.5 hours. Would definitely recommend. Had tow bar applied by an expert! Excellent service, pronto no muck around guys!! I Highly highly recommend them, I drove up from the Waikato in a freakn storm for this and it was worth it! Excellent service and a great price. These guys will be our first and only call in the future. Thanks so much for the super quick tow bar fitting today. Excellent price,service and friendly guys. You will not be dissapointed. Highly reccomended. Excellent service. Was the best price out of 4 I called. Came to me to do the job, arrived on time and was friendly and quick.